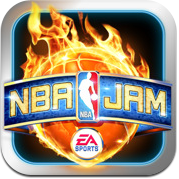 EA Sports has updated NBA JAM, adding a new local multiplayer option and introducing a separate ‘HD’ version exclusive to the iPad. NBA JAM, an arcade basketball game featuring each NBA team and their respective stars, lets users play through a multitude of challenges that unlock additional NBA players. Players are also given the option to directly purchase the unlocks via the in-app purchasing system. While the game has offered both quick play and campaign modes since its launch, the most recent iteration allows players to compete against a friend via Wi-Fi or Bluetooth. The update also includes several tweaks to improve gameplay under the hood. EA Sports has also introduced NBA JAM Lite, which sports the Lakers and Celtics in a single quarter shootout. An ‘HD’, separate version of the game for iPad users is also now available, priced at $9.99. The standard application, available for the iPhone and iPod Touch, remains on sale for a mere 99 cents following EA’s Easter spectacular.